Yesterday was rain-pocolypse here in the Valley. Just in time for everyone to head home, rain just poured from the sky, making it almost impossible to avoid getting soaked when you ventured outside. We’ve had quite a few thunderstorms lately, but I have to tell you, I sitll haven’t gotten sick of them. I like the rain and the thunderstorms, as long as I don’t have to actually go outside. And of course, as it began to pour, here at the Daily Item, since we are all essentially perpetual 13-year-olds, we were fascinated by looking out our window at the storm. 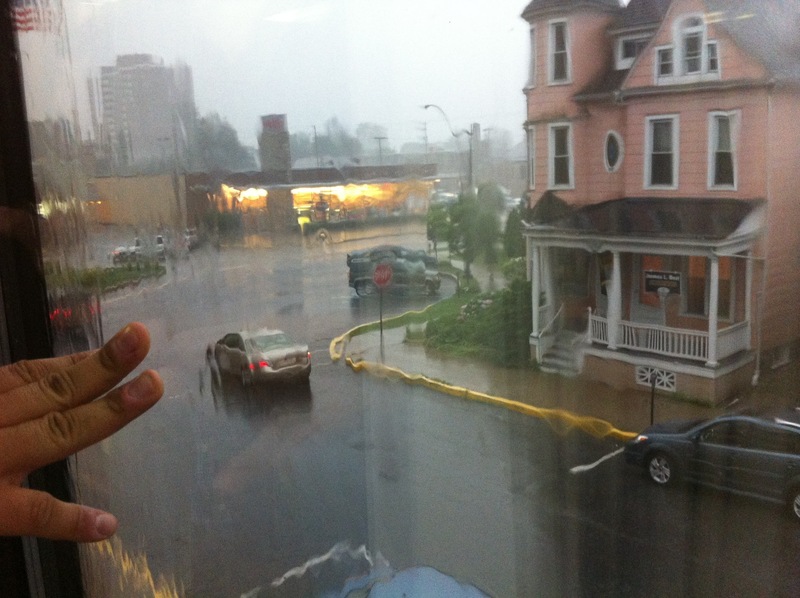 Here’s a look out our window – those fingers belong to the Daily Item’s own Francis Scarcella. Last night and through this morning it stormed something fierce here in the Valley – and despite the sunshine currently outside our windows, it’s supposed to get rainy again this afternoon. The entire nation has been under a severe weather alert for the last two days with a “Derecho” taking hold. The best place to see everyone’s storm photos? Twitter, obviously. Here’s some of the best from the East Coast, which is currently under the thumb of the storm. Soaking wet on the job. Yesterday I spent plenty of time outdoors. Oh, and it rained 3 inches yesterday, mostly in the morning. Me and 240 kids were outside for Envirothon. We were in the rain until the event was canceled.